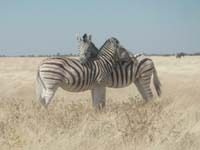 Heute schreibt Bernice Lebe aus Namibia im Weblog. Bernice ist eine der Jugendlichen, die unsere Gruppe aus Düsseldorf während ihrer Reise begleiten. Bernice berichtet von dieser Begegnung aus namibischer Sicht. Dear Diary, 10:00 o’clock – we depart from Etosha which I think was a great experience for all of us. Today we had a long trip to Swakopmund through different towns. I can name them. The first one is Outjo – which I really find an interesting place, coz I think Outjo is one of the peaceful places in Namibia. The second place was Kalkveld, which is one of our country villages. The difference there is their ghettos are build with stick and mud like in the older days traditional houses, which I find better and warmer. The third place was Omaruru, where we had a little break. Omaruru is quite a good town also one of the peaceful towns. The fourth place was Karibib – it is well known for manufacturing the best tiles and tombstones in Namibia and one at our greatest mine is situated 10 km from Karibib, which is the Nauachab Gold mine. My eldest brother Haroldt is also working there, but it was a pity we couldn’t meet him due to the short time. The fifth place was Usakos. I don’t know why, but me and my brother Benedict called that place Usakos the “Ghost Town”, coz it looks like one still to me it´s kind of spooky. I think that I must admit one thing although we have got few people compared to other countries, through negative/positive lifestyle, we Namibians should be proud at the beautiful contrast we have and also the freedom we have, I think that we should also be thankful. At last after six hours drive we arrived at the place to be so called Swakopmund. Swakopmund is one of the famous places for tourists and also for Namibians. Especially in holidays, it is one at the most beautiful places in Namiba with it’s beautiful , extraordinary buildings, but the people are most attracted by the beautiful sea, which is very great for “chilling”. We are accommodated at the Guesthouse of ELCRN (Evangelical Lutheran Church in the Republic of Namibia), which we all find comfortable to stay. So I think everyone will have a good sleep after all, coz surely it was a very long drive. Me, Lionel, Cornelius, Judith and Nina went today to play for sometime in the sea. The sea was quite cold, but we really did enjoy ourselves. Afterwards we came back to get ready for dinner. The food was really delicious. Afterwards some went home and some stayed to have fun. Hinweis: Dies ist ein archivierter Beitrag vom Donnerstag, 13. Juli 2006. Die letzte Aktualierung erfolgte am Freitag, 14. Juli 2006. Grundsätzlich verändern wir Achivbeiträge nicht, ggf. sind einzelne Informationen und Links veraltet.